The SmartBind 19 Ring Comb Punch and Bind Machine is a perfect combination of style and performance. The SmartBind 19 is a quiet punching machine that can punch up to 12 sheets of paper and 19 holes at once. The SmartBind is ideal for small and medium sized businesses that want both a stylish machine as well as a high performance machine. 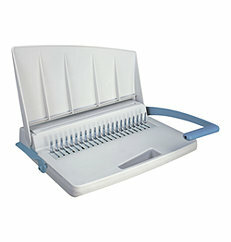 This machine can bind documents that are up to 1 inch thick or 200 pages when using plastic combs. The SmartBind is not only affordable, but it is easy to use so you can create professional-looking reports, proposals, and booklets within minutes. If you have any questions or are interested in purchasing the SmartBind 19 Ring Comb Punch and Bind Machine, visit us at SpiralBinding.com. We have great pricing on a full line of Desktop Punch and Bind Equipment. Call us at 1-800-631-3572 for more information!